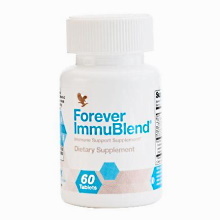 Forever ImmuΒlend is designed to support immune system function with its exclusive formula, by addressing all aspects of the immune system from its first line of defense to its last, providing both foundational nutrients required for a healthy immune system and natural botanicals that work synergistically to support immune function. Supports all aspects of immune system function. Provides a variety of nutrients to support immune system activity. Forever ImmuΒlend helps the body’s biological defense system to operate at peak performance so we can carry on our daily routine without any cares. Each ingredient in the proprietary blend is specifically chosen for the crucial role it plays in supporting the body’s immune system function. Fructooligosaccharides . Promote healthy levels of probiotic bacteria in the digestive system. Lactoferrin . Supports immune cell production and helps maintain optimum levels of beneficial bacteria in the intestines. Maitake mushrooms and Shiitake mushrooms . Support immune cell production and cardiovascular function. Vitamin D . Strengthens immune cells. Vitamin C . Fights free radicals. Zinc . Fights free radicals and supports immune cell production. Take 2 tablets Forever ImmuΒlend daily as a dietary supplement. Caution: Consult your doctor before taking if you are pregnant, trying to conceive, or nursing.